Showcased as a Concept at the 2018 Geneva Motor Show, the Senna GTR has been unveiled in its final form as the most extreme track-focused car from McLaren till date; more powerful and lighter than the road-legal Senna. Just twelve months after it was revealed as a concept car at the Geneva International Motor Show, the McLaren Senna GTR joins the brand's Ultimate series line-up as the third model, after the Senna and the Speedtail. Sharing its underpinnings with the road-legal Senna, the Senna GTR takes the performance figures of the road car to the next level, thanks to no road regulation constraints. The GTR also succeeds the legendary Le Mans-winning McLaren F1 GTR of 1995 and the 2015 P1 GTR as well. 'The McLaren Senna GTR is a perfect example of our determination to bring our customers the Ultimate expression of track driving performance and excitement. 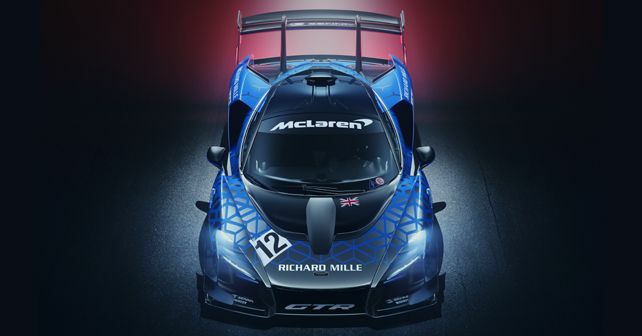 The McLaren Senna was designed from the outset to be an extreme track car, but the 2018 McLaren Senna GTR Concept suggested how much further we could go and now, free from the constraints of road car legislation and motorsport competition rules, we have pushed the limits of what is technically possible to advance circuit driving capability to another level entirely,' said Mike Flewitt, Chief Executive Officer, McLaren Automotive. The Senna GTR is powered by McLaren's existing 4.0-litre twin-turbocharged V8 power unit. However, in the Senna GTR, the M840TR unit generates 814bhp and 800Nm of torque, 25bhp more than the Senna road car. The extra boost has been achieved by recalibrating the Engine Control Unit (ECU) and by removing the secondary catalyst to reduce back pressure. The Senna GTR also weighs 9kg less than the road car (1,188kg dry weight) which gives it a power-to-weight ratio of 685bhp per tonne. While the GTR continues to put down all this power down using the same seven-speed Seamless Shift Gearbox (SSG) which can be found in the Senna, it gains a new 'Wet' driving mode which provides greater support from the car's ESP and ABS systems. With the GTR, McLaren engineers have also been able to achieve even higher levels of downforce, peaking at more than 1,000kg. The Senna GTR can produce the same levels of downforce as the standard car (800kg) at 15 per cent less speed. The improved downforce, aided by the weight loss, comes courtesy of a wider front and rear track (by 77mm and 68mm, respectively) along with a 34mm wider chassis than the Senna. Not bound by the GT3 regulations (which restricts wheels size to 18-inch), the Senna GTR gets new 19-inch wheels like the regular Senna but with a centre-lock design, which come shod with Pirelli slicks. Just 75 McLaren Senna GTRs will be built to order at the McLaren Production Centre in Woking, UK, with deliveries set to begin in September 2019. However, all 75 units were declared sold within weeks of its debut at the 2018 Geneva Motos Show. Each McLaren Senna GTR will setback its owner a whopping £1.1 million, before taxes.